Are you constantly seeking a better relationship with the Qur’an but feel frustrated with the huge tafsir books and your tight schedule? You’re not alone. Well, let’s start this off with a confession. I have always found it hard to keep a daily wird of reciting Qur’an (the part of the Qur’an one reads or assigns to him/herself daily). Sometimes I would get my spirits up and commit, but that would last for a couple of weeks only. I used to come up with a whole lot of excuses: You’re a medical student. You have exams. You’ve had a long day today. Tomorrow is a long day, you need to go to sleep. At the times when I used to commit, what usually made me stop was that the quality of my wird was not satisfying enough to me. Every once in a while I would be touched by a verse, but most of the time I would merely recite – without understanding, or more accurately, without trying to understand. Focus less on quantity, more on quality: I committed myself to reciting a minimum of one page, but whenever I feel like more I’ll do more. I won’t repeat my mistake of setting a minimum of one juz’ per night from the start. Double up: I read my wird in the morning and then recite the same verses while praying qiyam. Somehow, repeating the same verses twice a day helped me reflect and ponder on them better. Draw stars: Here is where the pencil magic kicks in! I drew asterisks in the margins of my mus’haf to mark the verses that touched me, whether I applied them to my own life or simply enjoyed their meaning or figurative language. The next time I read those verses, their effect on me was much deeper and reflecting on them (or sometimes just being fascinated by them) was much easier! Furthermore, whenever I reached the same page again, I would add more stars. So the page that started with having one star ended up with three or four; the verses that move my heart have now doubled at least, Alhamdulillah! Look for themes and patterns: Sometimes a certain surah mentions a lot of blessings, for example, or one of Allah’s Most Beautiful Names or attributes are repeated many times. I believe this is done to draw our attention to a certain theme so that we will read all the verses in the context of that theme. Sometimes I find themes for the whole surah and sometimes for a page or a group of verses. Whatever it is, I note it down (blessings, Ash-Shakur, etc) in one or two words in the upper margin of the page. Reflect on word usage: Do you know that feeling you get while reading a piece of literature when you just wonder: why did the writer use this word here? And why not that word? Well, when reading literature you could end up over-analysing to no avail. However, with the Holy Qur’an, it’s IMPOSSIBLE. Allah says in the first verse of Surat Hud: “Alif, Lam, Ra. [This is] a Book whose verses are perfected and then presented in detail from [one who is] Wise and Acquainted” [Qur’an: Chapter 11, Verse 1]. Perfected! So always take a few moments to think: Why did Allah say “Hakeem” and “Khabeer” here? Why “Wadud” there? Why does this verse say Mu’mineen (believers) and that one say Muttaqeen (those who fear Allah)? The more you think, the more you’ll find answers In sha Allah. Tafsir also helps a lot with this mission. I try to remind myself of what I’ve reached with just a few words in pencil in the lower margin of the page. Read tafsir: For the daily wird I use Al-Tafsir Al-Muyassar which is technically the paraphrasing of the verses into simpler language. When I have time to dig deeper I go for bigger books and online lectures. For my daily dose of tafsir, I use the desktop version of Ayat. It comes in really handy! Make dua: This has become a cliche from overuse, yet we rarely use it correctly! When we make dua, we tend to ask for good grades, more money and ease after hardship. If we pray for guidance and increase in knowledge of the Qur’an just as insistingly, Allah The Most Generous shall never turn us down, In sha Allah. I sincerely hope these seven simple yet powerful tips will help boost your reflection of the Holy Qur’an In sha Allah, as they did for me. 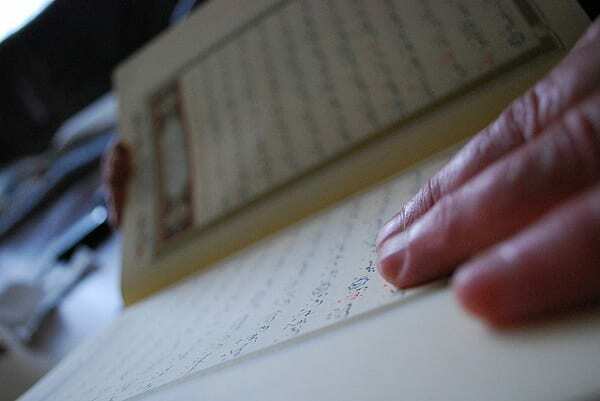 What other tips and tricks do you use to help you reflect on the Qur’an while reading it or listening to it? Please share them below! Enas Khaled Aliyuddin is an Egyptian medical student and a big fan of environmental science. She aspires to be a productive Muslim doctor and to have a firm relationship with the Qur’an.